Meeting registration and hotel reservations are now open and abstracts are being accepted for the 47th annual meeting of the Association of Earth Science Editors (AESE), "Native Resources: Building on the Bedrock of Geoscience Editing," to be held October 10-13, 2013, in Tulsa, Oklahoma. AESE will meet in the top-rated Courtyard by Marriott Tulsa Downtown, 415 South Boston Avenue, the recently renovated historic Atlas Life Insurance building in the Art Deco district of "America's Most Beautiful City." Tulsa was the "Oil Capital of the World" for several decades and a center of development for petroleum geoscience. The meeting will include an opening reception, technical talks, field trips, freelancers' breakfast, survey editors' breakfast, business luncheon, awards dinner with entertainment, and optional free-time activities. The board will meet at 1 p.m. October 10 and 9 a.m. October 14. Meeting registration fees will increase after September 1. Hotel reservations are due by September 26. Be sure to ask for the AESE room rate of $89 per night. Abstracts for technical talks are due September 1. Technical sessions will be held on October 11 and the morning of October 12. Potential topics include Web and Wiki editing, journal and book management systems, launching a journal, indexing, abstracting, geoarchaeology publishing, geohazard education, georeferencing, open access, permissions, the development of geoscience publishing, naming of geographic and geologic features, and "the scientist as author and editor." Other topics are also welcome. The field trips will focus on "Exploring our Black Gold Legacy: The Geology, Art, and Architecture of Oklahoma Oil Men." AESE members are involved in editing and publication of material pertaining to the earth sciences. AESE provides a forum for the interchange of ideas for more effective dissemination of earth-science information to the scientific community, educators and students, and the public. For details about the meeting, see the attached registration form, the call for abstracts, and the Meeting Logistics (NEW). For more information, contact Rowena Mills, host chair, hrmills777@yahoo.com, visit www.aese.org, and watch for forthcoming issues of AESE Blueline. 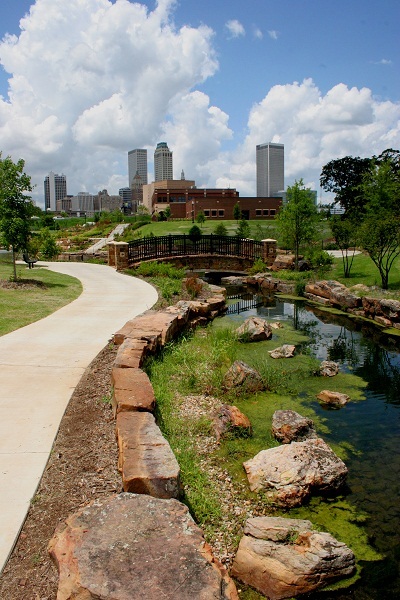 The skyline of downtown Tulsa, Oklahoma, viewed from Centennial Park, blends Art Deco architecture and taller structures from later eras. The Mid-Continent Tower (third tower from left, with copper roof) consists of the 16-story Cosden Oil Tudor-Gothic building, built in 1918 as Tulsa's first skyscraper, with an additional 20 stories in the same style, cantilevered above it in 1984. The 52-story Bank of Oklahoma building (BOK Tower, on right), constructed in 1975, was until 2011 the tallest building in an eight-state region. It was created by the architect who designed the World Trade Center towers, with similar style and construction. The 47th annual meeting of the Association of Earth Science Editors will be held October 10-13, 2013, in the Coutryard by Marriott Tulsa Downtown, next door to the Mid-Continent Tower. Photograph courtesy of Tulsa Convention and Visitors Bureau. Used by permission.